I had 8 blocks. I bordered four in red and 4 in green, then using an on-point layout, I alternated the bordered 4-patches with plain black squares and red and green setting triangles. The bias binding was made from fabric leftover from a Victorian dress made long ago for my youngest daughter. The backing is a plain red twill. The entire project ended up measuring 11" x 18" ... more or less a placemat size, although I had not intended it to *be* a placemat. At this point in time, I have no intention of making any more of them. I don't have enough of the specific plain red or green fabrics left to do so, although using slightly different shades probably wouldn't make that much of a difference. I'm not even sure if I have any more of the fabric used in the 4-patches, but again, I'm sure I could scare something comparable up, if I was so inclined. Which I am not. 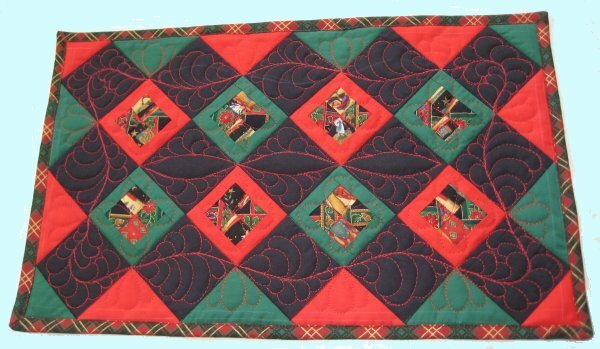 I free-motion quilted it on my home machine, a Janome 6500, using a shiny red machine embroidery thread. I chalked in the spine of the feathers then free-motioned the feathers. 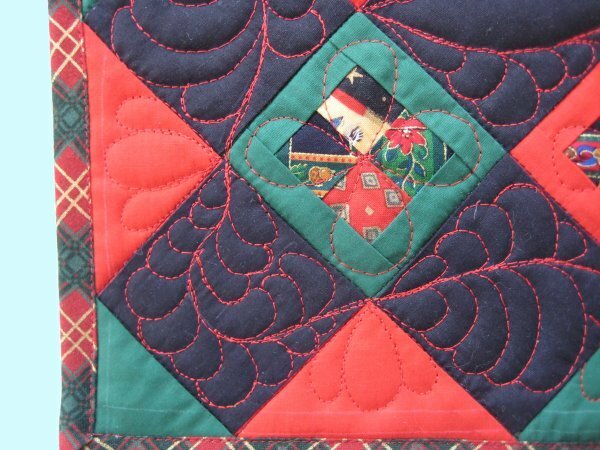 I have a lot of respect for quilters who use their home sewing machines! I'm so pleased that I finally learned the secret to doing inside curves with feathers! (mark a diagonal to bisect the inside curve then use that line as the limit line for the outer edge of the feathers). The setting triangles got three loops and the 4-patches got a four loop design. 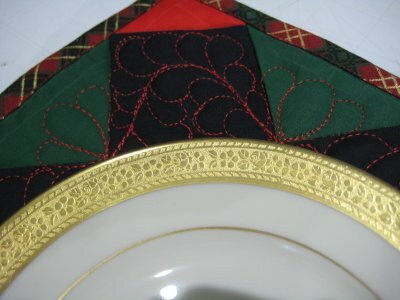 For the ::ahem:: photo shoot, I used my mother-in-law's china, Rangil's "Normandie" pattern, as a place setting. 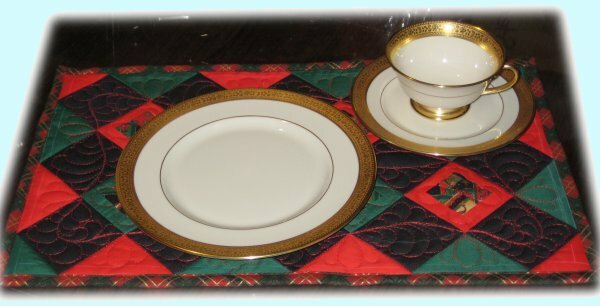 This is such pretty china ... the gold border around the circumference is a lovely embossed gold pattern.